At Farey Transport we pride ourselves in listening to our customer needs and wants and ensuring we work in a professional manner. We believe in the right person for the right job and value team members who take charge and “own” the problem. We promote a nurturing/safe work environment, staff development and provide training to encourage career development. Farey Transport staff are a dedicated team who work together towards common goals. Would you like to be supported by a family established community of drivers, where you are respected as a person and not just a number?? 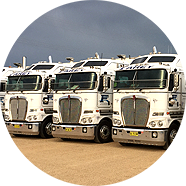 We are currently experiencing unprecedented growth, and with growth comes the purchasing of new equipment and so therefore the need for more of the integral part of our business, our drivers, at present we require the services of additional interstate linehaul drivers. The position is an interstate linehaul position where you will be travelling between Wagga Wagga, Brisbane, Sydney, Melbourne and Adelaide to deliver FMCG. Due to our 1 truck 1 driver policy, you will be driving your own late model Kenworth prime mover, towing late model FTE trailers that are all maintained to the highest of standards. The current award km rate which is recorded off the speedo. For nights away from home. Suitable applicants will hold a minimum HC drivers license, be self-motivated and well presented. You will need good communication skills and a can-do attitude, as well as a sound knowledge of national work/rest hour requirements. BFM accreditation and refrigerated transport experience would be an advantage however certainly not essential, we are more than happy to train the right people. We require all new employees to supply a recent RMS printout and be prepared to undergo a pre-employment medical, including a drug and alcohol screening. Our motto here at FTT is “large enough to serve, small enough to care” so pick up the phone and give us a call, we want to hear from you!